Our theory of Transformative EI has been linked to transformational leadership (Tang, Yin, & Nelson, 2010), resilience (Trapp, 2010), and work-life contentment (Hammett, 2007). It has also been recommended through original research for the enhancement of a university business curriculum (Villarreal, 2010; Ramos-Villarreal & Holland, 2011). The goal of the Leadership Development Workshop is to engage practicing leaders and leaders of the future in a continuous, self-directed, and reflective learning process that helps them personally explore and develop enduring behaviors–character that reflects the core values of integrity, service before self, and excellence. The academic study of leadership, having a good understanding of leadership theory and ethics, is crucial for building technically capable leaders. A parallel study of self related to the enduring behaviors provides the catalyst for excellent leadership. Leadership excellence is a self-directed process of developing quality from within. The one day seminar on leadership excellence is based on the introduction and explanation of EI as the learned ability to think constructively and act wisely, self-exploration of personal excellence using the Personal Excellence Map®, the introduction of the PEM-360® for uncovering blind spots, and the EI Coaching Map® for ongoing development and growth. Cost: $250 per person (plus expenses if exported to your location). 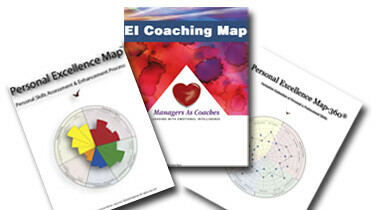 Includes the PEM®, PEM-36®, and EI Coaching Map®. Contact us for more information.